greguu doesn't have a personal statement currently. I have not updated the rootfs for ALARMZ (ArchLinuxARM Zaurus) for a while. I hope there are still some of you out there using it. It would be really good to know if you are. If you like to try a newer Linux Kernel on your Zaurus, please check out this post on the Voidz section in the forum. If there is enough interest, I will release a newer ALARMZ rootfs including the 5.0 kernel. Note: If you like to test and run the kernel, you will need to download, install it and update your boot.cfg manually. This cable is available on aliexpress and other sites. It does work out of the box thanks to the PL2303 chip set. It is useful for those of us that need RS232 on the go. The cable is very compact, too. 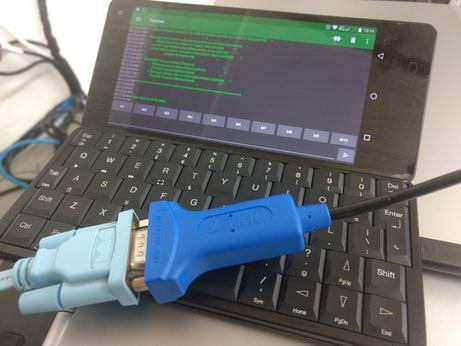 Example: Connecting on Android to a CISCO switch using the "Serial USB Terminal" app. Note: This is not a UART cable. For us Zaurus users, no matter what distro used, this is a great browser! Instead, just run the docker instance as mentioned on brow.sh on a x86 or ARMv6 computer locally or even host it in the cloud. Then use ssh to browse via brow.sh remotely ! Or try the live free ssh access provided by brow.sh as mentioned at the end of this post. Note: Currently there is no keyboard only navigation support. You need a mouse. You can load custom pages by pressing CTRL+L and entering a page URL. Scrolling works too, but not interaction with pages. This is a feature that is being worked on and we hopefully see VIM like key-bindings, soon. Note: This repo is in a testing phase and will currently allow you to upgrade from a build5 rootfs or older to build6. Additional packages will be announced here for testing. Many Thanks go to Varti & ibiblio for hosting this repository! `https://www.oesf.org/repository/feeds/voidlinux/testing/build6' repository has been RSA signed by "greguu"
3 downloaded, 2 installed, 2 updated, 2 configured, 0 removed. 21 downloaded, 1 installed, 31 updated, 1 configured, 0 removed. 04. The kernel was also upgraded, so reboot to have the change take effect. This is a reference guide on how to install Void Linux (armv5tel-musl) on a Sharp Zaurus (C3x00) device. A kexecboot kernel is required to boot Void Linux on your Zaurus. If you do not have already a kexecboot kernel installed, get one from the sources below and follow the instructions. 8. From the menu options choose option "4" (Update), next "2" (SD) and confirm "Y"
Note: The rootfs is updated regularly and very much experimental at this stage. Each build will feature a build number, eg Build-002. Please use always the latest build available for a fresh install. Note: If using e2fsprogs version >=1.43.9 you will need to exclude the metadata checksum feature upon creation as shown above otherwise the kexecboot kernel will fail to mount it. Keeping the feature enabled (default with newer e2fsprogs) will likely slow things down on the Zaurus. 02.2. Extract the downloaded rootfs tar.xz onto the SD card using the tar command, umount and boot the SD card on the Zaurus. 02.3. Logon as root (default password is "voidlinux") and change root password via the "passwd" command. Note: Leave HOSTNAME and HARDWARECLOCK commented out. Note: This should bring up ethernet (CF or USB) via dhcp automatically and set the correct time as well as enable ssh listening on port 22 as default. Make sure the CF or USB WiFi device is connected. If you have a prism based card, it may be required to blacklist the orinoco_cs module fist. Reboot or "rmmod" the orinoco modules. To enable sound output, unmute the headphone or speaker channels via alsamixer and store the settings afterwards. Play a sound file to test. Note: This is an experimental feed that contains packages for build7. If you installed a previous rootfs, you can upgrade to build7 using xbps-install! Note: Void for Zaurus (voidz) is very basic at this stage does not feature any graphical desktop. THIS GUIDE IS WORK IN PROGRESS AND NOT COMPLETE. ANY ISSUES OR QUESTIONS RELATED TO VOID INSTALLATION, PLEASE POST BELOW. THANKS. Other users have left no comments for greguu.